OTTAWA, ON – Dominion City Brewing has announced details of a new beer being released this weekend to celebrate the 1st birthday of the brewery, and to honour the area that it calls home. 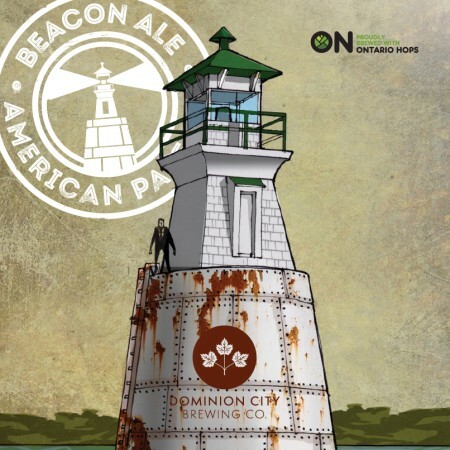 Beacon Ale is an American-style pale ale dedicated to Beacon Hill, the neighbourhood in the east end of Ottawa where Dominion City is located. It features a label designed by Andrew King, a local artist and amateur historian who has researched and written about the history of the area. Brewed with 100 per cent Ontario-grown Galena hops, this snappy, refreshing beer is loaded with blood orange, papaya and floral hop aroma contributed by our province’s unique growing conditions. It is named for a now dilapidated 150-year-old lighthouse whose rusty steel platform still stands today a mere 750 metres north of the brewery in the middle of the Ottawa River. Beacon Ale will go on sale tomorrow (August 15th) at 1:30 PM as part of a 1st anniversary party at the brewery. There will other special beers and snacks available, as well as a limited edition t-shirt of the Beacon Ale artwork, with proceeds supporting the Gloucester Emergency Food Cupboard.